Wash and wax your boat – without a free-flowing source of water! Marine 31 Port to Starboard Rinseless Wash with Carnauba Wax enables you to wash and wax your boat the environmentally-friendly way – without using a hose! Rinse-free formula is ideal for areas with water restrictions or for the environmentally conscious. Formulated with real Carnauba wax, Marine 31 Port to Starboard Rinseless Wash with Carnauba Wax imparts a high-gloss, slick finish and durable UV protection after each wash.
As each year goes by, more areas throughout the world enforce stringent water restrictions. The growing trend for conserving water means we have to be selective with the products and processes we use to wash our beloved boats. Up until now, the only way to effectively clean your boat of dirt and grime was by dragging out the hose and washing it the traditional way. Put away the hose and wash your boat the environmentally-responsible way with Marine 31 Port to Starboard Rinseless Wash with Carnauba Wax! Washing your boat without a hose is indeed possible! Marine 31 Port to Starboard Rinseless Wash with Carnauba Wax is a high-lubricity, suds-free wash and wax formula that doesn’t need to be rinsed off the surface. It’s as simple as washing an area and towel drying it. By performing a rinseless wash you save time while using considerably less water. 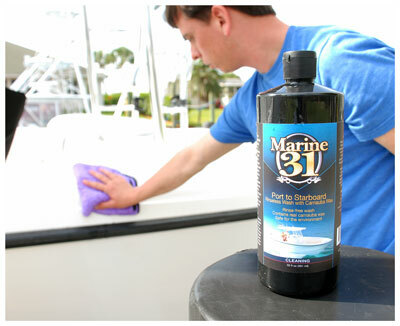 What’s more, by washing your boat with Marine 31 Port to Starboard Rinseless Wash with Carnauba Wax you eliminate the run-off that occurs from rinsing a soapy boat. Marine 31 Port to Starboard Rinseless Wash with Carnauba Wax contains a complex blend of lubricants and substantive polymers that enable it safely to release, lift and trap dirt particles away from the finish as you clean. This prevents the surface from being scratched as you wash. Marine 31 Port to Starboard Rinseless Wash with Carnauba Wax can be used to clean most hard marine surfaces including gel coat, fiberglass, stainless steel, plexiglass, composite surfaces and more. Marine 31 Port to Starboard Rinseless Wash with Carnauba Wax is formulated using the most advanced UVA and UVB absorbers that can be put into a marine care product. The UV protection combined with the high-grade Carnauba wax in Marine 31 Port to Starboard Rinseless Wash with Carnauba Wax ensures your boat stays protected against the elements while retaining a “just waxed” shine. Marine 31 Port to Starboard Rinseless Wash with Carnauba Wax is water-soluble, harbor-safe, and biodegradable. 1. Add 1 ounce of product into a bucket containing 2 gallons of water. This will be your wash bucket. Add 3 gallons of water to a separate bucket containing a Grit Guard Insert. This will be your rinse bucket. 2. 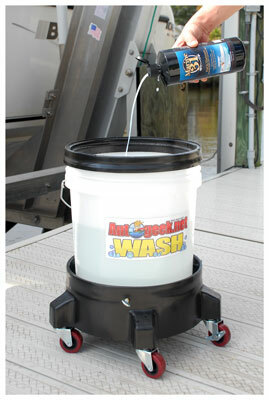 Soak a mitt or sponge in the wash bucket and wash the boat one section at a time. 3. After washing an area, dry it using a high-quality drying towel, like the Supreme Guzzler Waffle Weave Drying Towel. 4. Place mitt or sponge in rinse bucket and agitate against Grit Guard Insert. 5. Thoroughly wring out mitt or sponge and place back into wash bucket. 6. Repeat steps 2-5 until entire boat is cleaned. Can a product like the Marine 31 Gel Coat Carnauba Wax + Sealant be put on over top of this product? Or is another product a better choice since this one already has wax? This question would also apply to the other wash and wax product that uses water. Can a product like the Marine 31 Gel Coat Carnauba Wax + Sealant be put on over top of this product? Or is another product a better choice since this one already has wax? This question would also apply to the other wash and wax product that uses water. It's not only completely okay to use it after the Port to Starboard Rinseless Wash & Wax but it's a good process. Nothing replaces a "normal" application of a real coat of wax.